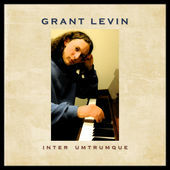 SAN FRANCISCO - Feb. 12, 2015 - PRLog -- Grant Levin (http://www.grantlevin.com), releases a new CD “Inter Umtrumque” (Beezwax Records), an all original composition compilation in a contemporary piano trio setting, from between the years of 2001 and 2008. Inter Umtrumque, which is latin, means "between two extremes". The title is reflective of the range and scope of the music performed by the composer Grant Levin (piano) and his sidemen Chris Amberger (bass), Rufus Haereiti (drums), Greg D’Augelli (soprano sax). Grant Levin is a multi-faceted contemporary pianist, band leader and writer of music who performs in various configurations from intimate settings to concert halls and festivals. His musical aesthetic is based on dynamics, showcasing the piano as an infinitely powerful instrument, allowing the audience to experience the sonic possibilities. "Grant Levin’s piano style is remarkable, innovative, modern and a little unbelievable", Wanda Stafford, jazz singer. He has worked with many great musicians such as: Pete Yellin, Jerry Dodgion, Dayna Stephens, Noel Jewkes, John Santos, Howard Wiley, Ray Obiedo, Dean Reilly, Melecio Magdaluyo, Marcus Shelby, and numerous others. He has also performed with Little Anthony and the Imperials on keyboards. Grant Levin will return to SFJAZZ Center (San Francisco, CA), to join Tiffany Austin as she performs Nina Simone’s High Priestess of Soul as part of the SFJAZZ Hotplate Series, February 12, at 8pm and 10pm. Other prominent venues where he has performed are Caroline H. Hume Concert Hall, San Francisco Conservatory of Music, Yoshi’s Oakland, 57th Street Gallery (Oakland, CA), Doc’s Lab (San Francisco, CA), Cafe Stritch (San Jose, CA), Mildred Owen Concert Hall (Pacifica, CA). His current regularly venues in the San Francisco jazz scene are Club Deluxe, Bird and Beckett Books and Records (San Francisco, CA) and Osteria Devino, (Sausalito, CA). Bay Area based Grant Levin is a multi-faceted contemporary pianist, band leader and writer of music who performs in various configurations from intimate settings to concert halls and festivals. His musical expression is centered around dynamics, showcasing his vision of the piano as an infinitely powerful instrument and gives the audience the experience of intangible sound levels where the ceiling is never revealed. Visit http://www.grantlevin.com or follow Grant Levin on Facebook (facebook.com/GrantLevinPianist), Twitter (@grant_levin), Google+ (google.com/+Grantlevin) or YouTube (YouTube.com/c/grantlevin).